Senior refining and technology industry players share their knowledge at ERTC: Ask The Experts. Refinery engineers are invited to join senior figures from the world of refining and technology at ERTC: Ask the Experts 2017. Delivering practical solutions to address everyday refining challenges and the low margins currently faced by the European industry, this two-day event comprises of a series of interactive Q&A sessions, poster session career development workshops, and networking activities. Running from 20-21 June 2017 in Cologne, Germany, it is the only event in Europe aimed specifically for process and maintenance engineers. ERTC: Ask the Experts is a spin-off from the respected ERTC (European Refining Technology Conference), Europe’s biggest and most important event for the European downstream industry, which celebrates its 22nd year in 2017. 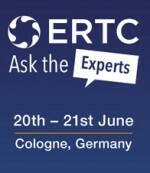 ERTC: Ask the Experts will address individual questions, such as how far existing equipment can be pushed to optimize production, as well as cover the latest innovations in technology to increase efficiency. The key themes for the event are gasoline processes, hydroprocessing, crude vacuum distillation and coking, troubleshooting and Fluid Catalytic Cracking (FCC). Is heat transfer technology failing British industry?